The SUPERSPORT "LTC," which stands for "long tial competition," is the "STC's" full sized sibling. The LTC is a full length, hand sculpted COMPETITION grade back protector than can be worn directly upon the body or inserted into leathers via the "LTC's" integral loop attachment system. The "LTC" features REMOVABLE-ADJUSTABLE elastic waist belts as STANDARD consumer items! Like the "STC," the "LTC" is equipped with IMPACT'S PATENTED expanding pouch technology, removable replaceable protection components and other patented features. The LTC provides excellent protection for kidneys, spine and coccyx (tailbone). Impact's SUPERSPORT line of back protectors provides PATENTED 21st century COMPETITION performance, at a price within reach of consumers. PATENTED PROTECTION TECHNOLOGY THAT WORKS! Provides greater protection cpverage and comfort. Provides superior impact dissipating surface area (performance) and comfort. Each attachment pad sports an AUXILIARY H. D. Polyethylene IMPACT DIFFUSER backing shield as added protection against impact energy. 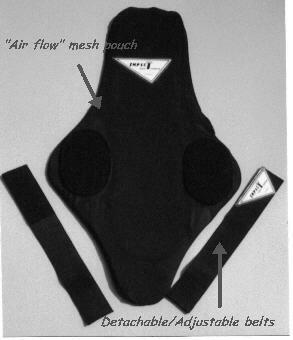 Provides enhanced protection for the lower spine. detachable- adjustable elastice waist belts are available in 2", 3", or 4" inch widths. inspecting or replacing internal protection components is accomplished in a matter of minutes!